In current dollars, charitable giving to the environment and animals sector grew by 12.4 percent over the two-year period of 2012 to 2014. Only the education and arts, culture, and humanities subsectors, at 13.2 percent and 13 percent respectively, grew more over that period. Charitable contributions to the environment and animals sector amounted to 3 percent of total giving in 2014. 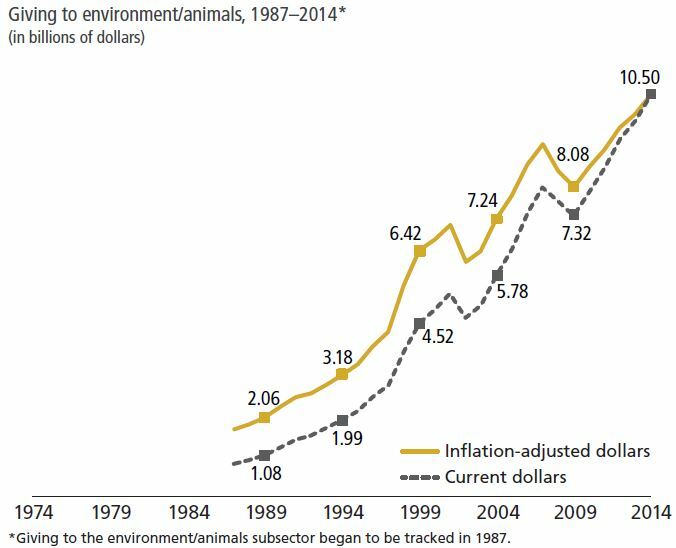 In 2014, charitable giving to environment and animal organizations reached the highest inflation-adjusted value recorded to date. The year 2013 saw the second-highest total amount to this sector, at $9.97 billion, followed by $9.63 billion for the year 2012. Compared to 2013, online giving showed particularly strong growth in this sector in 2014, according to Blackbaud’s 2014 Charitable Giving Report. Big visions inspire big gifts. Big gifts make significant differences, and we know that people are willing to make big gifts to bold and inspired visions. Think about how you’re engaging stakeholders both internally and externally to develop visions that resonate with deeply held values and will lead to giving opportunities that will inspire support. Understand your donor’s motivations. The data shows that the environment and animals sector is one of the fastest growing destinations for philanthropy in the U.S. In order to leverage the sector’s strength, it is essential to understand your donor types and identify how donors connect with your cause. The key to attracting donor interest is pinpointing their values and motivations for gratitude, and harnessing institutional resources and relationships with key leaders to convert that emotion into philanthropy. Don’t forget about marketing and communications. Strategic marketing and communications efforts will help create greater awareness of your organization – and its mission and results – in an increasingly competitive landscape. This is especially true in the digital space where a donor’s brief visit to your website can be the difference between wanting to learn more or deciding to move on. Consider how your website and social media platforms can not only tell great stories, but inspire action. Be prepared – and open – to explore blended gifts with your major donors. More often than not, a major donor’s financial situation will be complex. Whether it’s impact investing, deferred giving, or a donor advised fund, you can help a donor or prospect avail herself of a multitude of strategies to make a more meaningful investment than perhaps she initially imagined. Questions? Please contact Kate Roosevelt. We are happy to further discuss Giving USA 2015 and subsector specific recommendations with you. Kate Roosevelt is Executive Vice President at Campbell & Company. Kate has helped organizations across the country raise more than $300 million. She brings to her work 20 years of experience in the nonprofit sector and a deep belief in every organization’s power to make an impact.